There was no way I was going to miss this movie – for two reasons, actually. The first being that my daughter usually beats me to the punch on new releases and I needed to see this one before she did just cuz. The second being Alex Garland. Now, I haven’t seen most of Garland’s work, but I liked Dredd a lot, despite it mostly being a RoboCop movie in disguise, and I flat out loved Ex Machina., which was, if memory serves, my favourite movie of 2015. Movie Review: ALIEN:COVENANT – serves the franchise better than Prometheus did, but suffers from the same maladies. I’ll begin by getting it out of the way first: I hated Prometheus. In terms of the franchise that was unleashed upon the world in 1979, it’s one of the weakest of the six core movies (I’m choosing to ignore the two crossover Alien v Predator movies) for a couple of reasons. Though in saying that, I give it props for the same reason I do 1986’s Aliens, namely the attempt to try to do something different with the concept. If you’re going to add another film to a franchise, you should at least do something unique. Let’s face it, the actual concept of Alien is not sophisticated: human beings find a desolate planet in deep space, get infected with an alien parasite which becomes something they have to destroy … or they’ll be destroyed by it. It suffers from the same self-limiting curse that comes with success: how do you make it just different enough without alienating the people that filled the studio coffers first time around? Confession time: I’m an agnostic skeptic. A perennial fence sitting, no-side choosing unbeliever. It pertains to science as well as religion. I’m squarely on the side of empirical data. If you can’t show me something that exists, all your anecdotal, mathematical models, and theories of the mechanics of the universe isn’t going to sway me. But I’m conflicted because I LOVE all that stuff. I love quantum physics, I love the supernatural, and I can because I’m no “expert” in either of them- meaning, I can enjoy the concepts and mentally consign them to the sci-fi and horror realms I enjoy without having to invest any “faith”. Einstein’s God Model, a low budget sci fi feature written and directed by Philip T. Johnson, attempts to tell a story combining theoretical physics and the afterlife – how could I not be drawn to it? 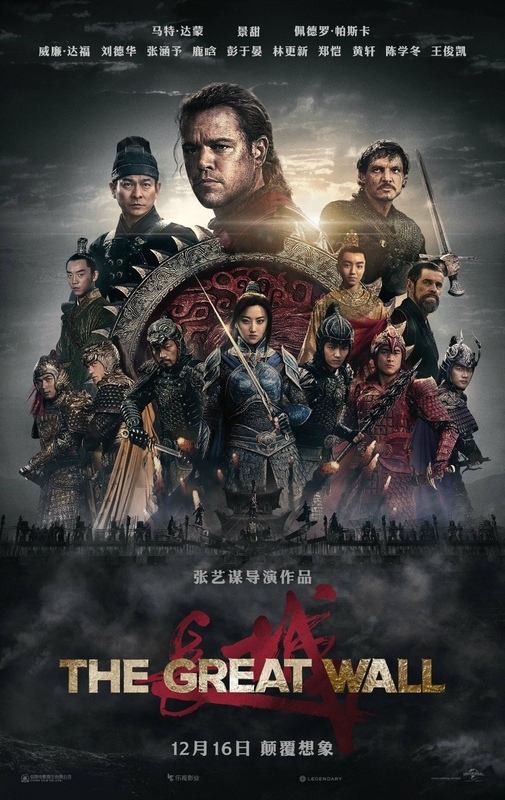 Movie Review: THE GREAT WALL – Utterly forgettable, underwritten monsters-attack movie. Even Damon looks uncommitted. D’you remember last year when Matt (Jason Bourne)Damon had to defend himself from accusations of what is referred to as “cultural appropriation” after doing a press junket for his movie The Great Wall? The accuser here was TV actress Constance Wu, who clearly only knew two things about the movie: that it was set in ancient China and starred white actor Matt Damon. Of course, it had to be racist casting, right? Trouble was, Wu had not read the screenplay and likely had not looked at the trades before jumping to her conclusions. The Chinese influence behind the camera on this movie is significant, and Damon was hired specifically because of worldwide name recognition. With a budget of $135 million on the line, it made sense to put someone like Damon in the lead role in order to guarantee a healthy global return. Last night I was cramped for time, so I had to pick a short movie. Let’s Be Evil had been sent to me a few weeks ago, and it was 82 minutes long – perfect! Not quite. Turns out there are many other things that would have been more worthwhile than watching this low budget sci-fi/horror. Directed by Martin Owen, and co-written by Owen and leading actress Elizabeth Morris, Let’s Be Evil tells the story of three broke young people (Morris, Kara Tointon, and Elliot James Langridge) who take a side gig as chaperones to a group of child geniuises enrolled in a mysterious project. Naturally, things go wrong, and the lives of the three protagonists are placed in peril. Movie Review: SciFi thriller MORGAN is a mostly dull and poorly written retread of other movies. Have you heard of the Black List? I don’t mean the James Spader TV show, I’m referring to the list of great, unproduced screenplays of the year. Being on the annual black list is something most would-be screenwriters dream of. It generally leads to a big money sale, and knocks down the doors of the movie industry. It includes some really good movies – Arrival in 2012, Spotlight in 2013, Manchester By The Sea in 2014, etc. But it also lists screenplays that went on to be critical and commercial duds: The Johnny Depp scifi thriller Transcendence, and the Naomi Watt starrer Shut In from 2012, and 2013’s Pan that’s best left forgotten. The 2014 list also includes Morgan, the movie I watched last night.